Endorsed by more than 170 disciplinary and professional organizations, the AAUP's 1940 Statement of Principles on Academic Freedom and Tenure is the definitive articulation of our principles and practices relating to academic freedom. The AAUP's procedures ensuring academic due process remain the model for professional employment practices on campuses throughout the country. Many college presidents and administrators rely on the Association’s policy statements and procedural recommendations for guidance on matters ranging from distance education and intellectual property to graduate student education and employment. In fact, more than a thousand faculty members call on the AAUP each year for advice and assistance, especially with situations involving alleged violations of academic freedom or due process rights. As a non-profit (501(c)(3)) organization, we serve the profession as a whole, and the services of our Committee A on Academic Freedom and Tenure are offered to all members of the profession, rather than just to the Association's members. The decision to conduct an on-campus investigation or otherwise assist in a particular case are based wholly on the merits of the case and the principles and standards which it implicates. In addition to our "case work," the Association works with Congress as well as with state legislators to promote effective higher education legislation. The Association also assists its members in developing more comprehensive lobbying programs at the state level, and monitoring pending legislation potentially affecting higher education and faculty in all 50 states. Because of our status as an educational charity, the AAUP-while lobbying on issues-does not endorse political parties or candidates. 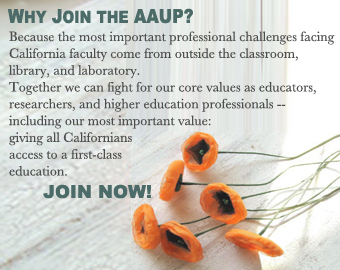 In addition to our legislative work, the AAUP strives to promote a better understanding of the profession and the purposes of higher education in the general public. In support of our standards, the AAUP’s legal department files amicusbriefs before the U.S. Supreme Court, as well as with federal and state appellate courts, to address significant issues of academic freedom. Our policy statements are frequently cited in court decisions and have become a sort of common law for the profession. The AAUP’s legal department also conducts studies and analyses of particular situations under the law which may be of particular concern to faculty. The results of much of this work are available online from the AAUP’s national web site. The AAUP annually publishes a nationally acclaimed faculty salary report that includes a comprehensive analysis of faculty salaries and benefits. In addition to its regular programs, the AAUP issues reports each year on subjects of special interest. Recent initiatives include reports on the use of part-time and non-tenure-track faculty, faculty workloads and state intervention, the future of Historically Black Colleges and Universities, and tenure in medical schools. For a list of upcoming activities and events, please visit our calendar page.